Sleaford Town manager Jamie Shaw’s side will go into their next FA Vase test in buoyant mood after returning to winning ways on Saturday. Harry Millard was the architect of Saturday’s 3-0 home win over Rothwell, scoring two and creating the other, as they warmed up for their first round tie against United Counties League rivals Peterborough Northern Star. “We’re really looking forward to the game,” said Shaw. 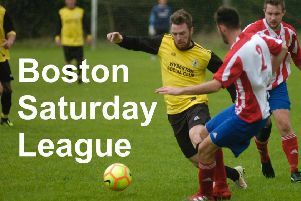 “We go into it full of confidence having managed to halt a mini run of defeats, while they (Northern Star) had a good run of form blown apart at home to Harborough at the weekend. In a goalless first half both Sleaford and bottom side Rothwell struggled to get to grips with a strong wind gusting at Eslaforde Park. But Millard put Town in front just six minutes into the second half, breaking from midfield to finish off a neat passing move. And there was a carbon copy 15 minutes from time following a counter-attack, launched from their own box by Dave Hone’s quick feet. There was also time for Scott Coupland to grab the first goal of his second spell with Sleaford Town, latching onto Millard’s through ball and showing excellent control before firing low into the corner. “It was good to get back to winning ways, even if the game itself wasn’t always pleasing on the eye,” Shaw added. “We played into a strong wind in the first half and we found it really difficult to get any rhythm to our game. “It was very disjointed although we were able to restrict Rothwell to only a handful of opportunities. “Having done the hard work in the first half, it was vital we came out with a greater intensity in the second and took advantage of the more favourable conditions. * Town’s home FA Vase tie Peterborough NS kicks off at Eslaforde Park at 3pm.